The recently certified G500 represents a leap forward in flight deck and flight control interface design, a bold move for a manufacturer as conservative as Gulfstream yet also a logical progression in business jet design. The G500 is a delight to fly, a significant step up in handling compared to the non-fly-by-wire (FBW) designs (G550 and below). And the many touchscreens that run the avionics and systems feel as natural as wings on airplanes. Although the G450 is out of production, the G550 remains in demand and will continue rolling off the production line as long as buyers continue placing orders for the 6,750-nm ultra-long-range jet. If that much range isn’t needed (nor the range of the G650) but a wider cabin and higher speed is, then the G500 and G600 ought to be a logical choice for those who appreciate the Gulfstream brand. The new cabin measures 91 inches wide and 74 inches high, while the G550 is 84 and 72 inches and the G650 is 98 and 75 inches. Range at Mach 0.90 with eight passengers and three crew is 4,400 nm in the G500 and 5,100 nm in the G600. Throttle back to Mach 0.85 and range climbs to 5,200 and 6,500, respectively. Those numbers, incidentally, are higher than originally projected: the G500’s range grew by 600 nm at Mach 0.90 and 200 nm at Mach 0.85. The G600’s range climbed 300 nm at both speeds. Both models are produced in the same building at Gulfstream’s Savannah, Georgia headquarters, with wings and horizontal stabilizers manufactured in an adjacent facility then moved over for mating with the fuselage. From a systems perspective, the big change with Symmetry is a newly added data-concentrator network (DCN), which forms the backbone of the new jets’ electronic network. The DCN connects all systems, and any data from those systems can easily be shared, published on synoptics displays, used for systems controls, and support health and trend monitoring. More than 15,000 parameters are monitored, and data is distributed via 14 routers installed throughout the airframe, connected via Ethernet cable. If there is a failure anywhere in the DCN, the data is still available because it is published to multiple routers. Adding new features to the G500 and G600 will be far simpler, because they can be plugged into the DCN instead of adding new wiring. The big advantage of the DCN is that it eliminates 200 to 300 pounds of components and wiring and makes new space available for cabin furnishings. First, touchscreens eliminate a huge number of mechanical and electrical switches, removing many possible points of failure and simplifying flight deck procedures. Going from dark cockpit to ready-for-engine-start in the G500 takes less than 10 minutes, about half as long as an experienced crew in a G550 (and far less than tyros during their first stint in a G550 simulator). Test and operating procedures are simpler, and there just aren’t that many switches to manipulate. And with three identical overhead panels that provide full access to all systems, two crewmembers can access different systems at the same time, if necessary. An example of this functionality is a guarded switch. Physical guards take up more space and are necessarily more complicated. In Gulfstream’s touchscreen world, a guarded switch requires two touches, one to select the option and a second to accept the choice (this is the touchscreen equivalent of lifting the guard then moving the switch). And the same can be done in reverse, too. A second factor benefits the OEM and ultimately the aircraft owner/operator, and this is that touchscreens can easily be modified to add new functionality, without having to dig a new hole somewhere in the flight deck to install a new switch. Manufacturers and aftermarket modifiers invariably come up with improvements and new capabilities, and there will likely be regulatory mandates to install new equipment in the future. Adding the switches to control the new equipment is so much easier with touchscreens and software. “Removing the constraints of hardware is huge,” said Evans. A G500/G600 is easy to spot because the pilots’ side windows are swept back instead of the vertical shaped aft edge on previous models. The new windows allow pilots to see the wingtips from the flight deck. The electrically actuated cabin entry door doesn’t touch the ground when opened, and the G500 can be towed while the door is fully open. The door is designed such that when the pilot steps on the first step, the handrail is in the exact right spot. When the pilot alights at the top of the steps, the doorway relative to the steps eliminates the need to duck to prevent hitting your head on the doorway. On the outside of the airframe, access panels are placed at locations that allow teams to service systems in parallel, a typical Gulfstream philosophy. The fuel panel can be controlled from the flight deck touchscreens. Something that is included only on FBW Gulfstreams is a ram-air turbine, and that is pretty much the major difference in the electrical system compared to non-FBW Gulfstreams. The baggage compartment volume is 175 cu ft and it is accessible in flight up to 40,000 feet, although that is an FAA limitation and not an EASA limitation. Gulfstream is working with the FAA on eliminating that restriction. The G500’s Pratt & Whitney Canada PurePower PW814GA engines each produce takeoff thrust of 15,144 pounds and they match the 50-inch fan diameter found on the G650’s Rolls-Royce engines. The PW814GA fan is a one-piece blisk, and the engine’s bypass ratio is 5.95 to 1. Its Talon X combustor helps the PW800 series deliver double-digit improvements over CAEP 8 emissions standards, and it also offers a double-digit noise margin compared to ICAO Stage 4 limits. Without the limitations of a traditional FMS and its multiple deep-pages interface, the Symmetry design allowed engineers to get creative in how pilots interact with the avionics. For example, pilots start on the touchscreen in FMS mode, which mimics the traditional FMS inputs, although in a much simpler and more intuitive interface. Tabs along the top of the touchscreen make available just what is needed, such as FMS init, flight plan, perf init, perf takeoff, landing. In the perf takeoff tab, not only does the touchscreen show the runway required (3,928 feet) versus available runway (7,002 feet), but it does so with a little runway diagram with color bands highlighting the required amount of pavement, making it easy to determine if there is enough runway or if it is going to be marginal. Green bands are good. Other information on this screen includes V speeds, takeoff weight, power setting, and accelerate stop/go distances. The takeoff tab, for example, includes V speeds (which remain yellow until the aircraft is properly configured), autobrake control, obstacle and runway information, flight plan departure and destination, and most handy, transponder setting and code and TCAS TA/RA switch. Being able to look down at the touchscreen to see all the information needed for the phase of flight—and that the checklist wants you to verify—makes so much more sense compared to earlier flight deck designs. No more looking at three or four different displays or FMS MCDUs; the information is consolidated on the touchscreen controller. The flight guidance panel, itself, is a vast improvement on earlier Gulfstreams’, with a logical layout clearly marking and separating speed, lateral, autopilot, vertical, and altitudecontrols. Another pilot-friendly feature is that button lights are separate from the button, so a pilot can make a selection and instantly see the light switch on or off without having to lift a finger off the button to verify what the light is doing. From the moment the wings started generating lift and we lifted off, I could appreciate what Evans said. Although the FBW flight controls are the next generation of the G650’s flight control system (with fewer remote electronic units, which improves reliability), the G500’s handling is even better. Only tiny movements of the stick are needed. But the stick also provides force-feel feedback to the pilot, one of the features of the BAE active sidesticks. The 1,715-cu-ft cabin in this G500 was configured with 13 seats in three zones, including two sets of double club seats forward, a three-seat divan opposite two club seats, and another two sets of double clubs around a single-pedestal table, which provides more legroom for occupants. Seat pitch is the same 105 inches as in the G650. A credenza houses a 28-inch monitor, which folds flat so it doesn’t take up any drawer space. The galley is in the aft cabin—although it can be situated forward if the customer wishes—and features deep counters and drawers and a large trash container, thanks to the extra cabin width. There was plenty of room for a coffee pot and espresso machine, convection oven, microwave, and a real refrigerator. A master control panel is available in the galley and also at the front of the G500. Gulfstream’s cabin management system gives passengers control of lighting, window shades, environmental system, and entertainment from touchscreen controls at each seat. The controls are hidden under sliding covers mounted in the side ledges next to the seats. Now that the G500 is FAA and EASA certified, Gulfstream also gained approval for EVS-to-land operations with EVS III, which means that properly trained pilots with a letter of authorization can fly an approach then touch down and roll out solely by reference to the HUD, with visibility as low as 1,000 feet RVR. Flying the G500 around multiple heading and altitude changes was simply a pleasure; the stick responded instantly to my every nudge, and it felt comfortable using just finger pressure to fly this responsive jet. The level of precision available with FBW flight controls is unsurpassed, and Gulfstream engineers have managed to design an airplane that pilots will love and that maximizes comfort for passengers. As we cleared the fence and dipped down to the runway, I focused on keeping the nose down and resisted the urge to put a little back pressure on the sidestick. The G500 responded perfectly when Dickerson agreed that we were low enough, and I gave the stick a tiny pull, then the main wheels touched smoothly, followed by the fuselage dropping gently onto the nosewheel. A touch of reverse thrust as the autobrakes caught hold—we had set them to medium—and the G500 quickly slowed to taxi speed. 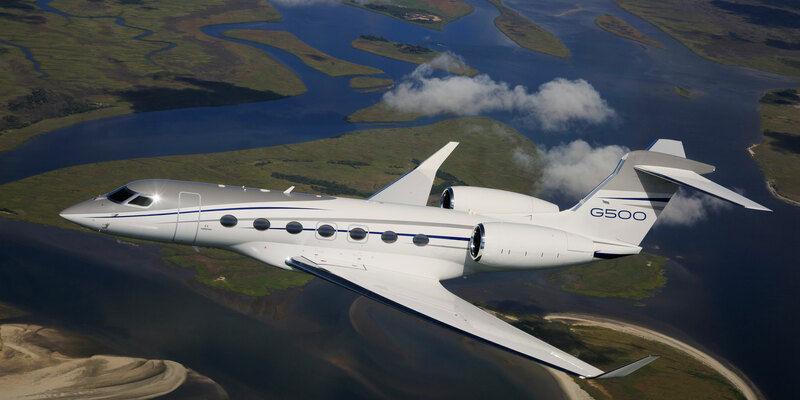 Gulfstream’s newest jets, the G500 and G600, are arguably among the most advanced business jets ever developed. After two hours flying the G500 (a little longer than planned thanks to the thunderstorms), I have no doubt that pilots, especially those with Gulfstream experience, will instantly feel comfortably at home in these airplanes. They may even feel that the initial training time is too long, because once they get used to the FBW sidesticks and the touchscreen interface, other than a big step up in performance, there is little new to learn. The flight control system is a speed- or trim-stable design, which means that the controls act like those of a non-FBW airplane, and when hand flying, the pilot must manipulate the controls to position the attitude as desired then trim to maintain that attitude. Without trimming, the airplane wants to return to the trimmed speed. For example, if the G500 is trimmed to, say, 200 knots, and the pilot pulls back and slows to 180 knots, the stick will feel heavy until trimmed to the new speed, just like an airplane with mechanical or hydraulic controls. In other words, stick forces vary according to the dynamic forces on the control surfaces and also if the other pilot is trying to move their stick, just like interconnected mechanical controls on traditional airplanes. There are four FBW modes: normal, alternate, direct, and backup, but only the normal mode is available to the pilots. The other modes kick in when certain equipment losses occur, and there is no way to force the FBW into the other modes. For example, if at least one inertial reference system (IRS) isn’t agreeing with one AHRS, the system degrades to alternate mode. The same occurs if there are aren’t at least two valid IRSs. If these conditions are fixed, the FBW automatically returns to normal mode, or the pilot can push the flight control reset switch to return to normal mode. In alternate mode, the autopilot no longer works and other functions are degraded. More features are unavailable in direct mode, which involves invalid signals from all four flight control computer channels, and from this mode, the controls can’t be returned to alternate or normal mode. In backup mode, the backup flight control units communicate directly with flight controls on a separate bus. The active-control sidesticks (ACS) design was carefully thought out and tested in the Gulfstream lab simulator. “We designed the inceptor [sidestick] to be an extension of ourselves,” said Evans. “It’s designed so that it’s at the natural reach position.” When a person’s arm rests on a table, the hand naturally tilts about 20 to 25 degrees inward (toward the fingers). Also, when reaching away from the body, the arm doesn’t go straight out, but moves away from the ribcage, he explained. So the sidestick is tilted inboard 20 to 25 degrees, to match the lower amount of strength when moving the stick outboard as compared to inboard (about a 30 percent difference), and it is toed outboard about three degrees. This all helps make moving the stick side to side feel exactly the same, whether inboard or outboard (depending on which seat the pilot is flying from) and prevents fore and aft movement of the stick from causing a roll change or vice versa.